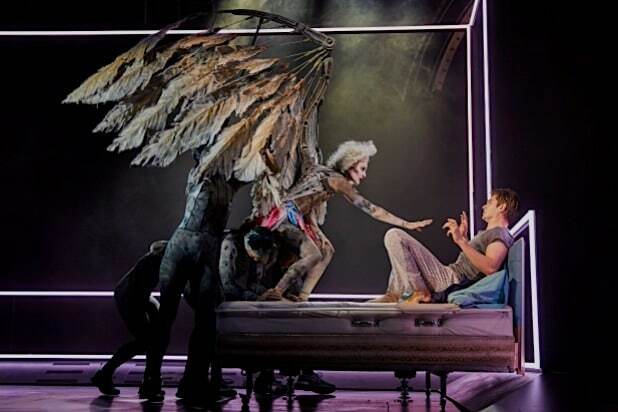 “Angels in America” returns to Broadway to help remind us why Tony Kushner was the Lin-Manuel Miranda of the 1990s. It’s the first Broadway revival for this 1993 marathon AIDS drama, and Marianne Elliott’s staging enthralls by putting the fantasy of Kushner’s play front and center. Her much-praised National Theatre production opened Sunday at the Neil Simon Theatre. “Angels in America” lasts nearly eight hours, and requires back-to-back performances to see the first half, “Millennium Approaches,” and the second, “Perestroika.” Those two ponderous titles appear to have inspired Elliott less than Kushner’s far more playful subhead, “A Gay Fantasia on National Themes,” fortunately. Fans of Elliott’s flashy legerdemain, most notably on display in “War Horse” and “The Curious Incident of the Dog in the Night-Time,” will not be disappointed. Whenever Kushner’s pontifications about the cosmos threaten to dominate, there’s Elliott and her designers hard at work to lift the verbal overload. Enhanced by lighting designer Paule Constable’s neon motif, Ian MacNeil’s set employs elevators, multiple turntables, aerial wires, and enormous glowing ladders to whipping us back and forth between hospital rooms and apartments, not to mention the rough streets of the Bronx and drug-induced trips to Antarctica and the Dark Ages. With several nods to Richard Strauss, Adrian Sutton’s portentous music underscores several of these kaleidoscopic segues, with Ian Dickinson’s sound design a nearly constant menace in the shadowy background. And no Elliott blockbuster would be complete without puppets, designed by Finn Caldwell and Nick Barnes with help from costume designer Nicky Gillibrand. The word “puppet” doesn’t begin to do justice to the primary Angel of the play’s title. As embodied by Amanda Lawrence and carried around on stage by six body-stockinged acrobats (a.k.a. Angel Shadows), who also work two enormous and very tattered wings, this angel would give any vampire pause in the scare department. And that’s just the spectacular “Millennium Approaches” finale when the Angel visits the HIV-infected and boyfriend-abandoned Prior Walter in his sick bed. It’s in “Perestroika” that Elliott, Lawrence, Gillibrand, Caldwell and Finn show their real theatrical mettle. The Angel grows creepier and more frazzled as she delivers to Prior more apocalyptic musings from a pissed off God in hiding. And bless those Angel Shadows. They almost never leave the stage in the second half, scuttling around like busy rodents to help move the scenery whenever all those elevators, turntables, aerial wires and ladders are given a brief rest. We expect a tech-heavy “Angels” from Elliott. What’s surprising here is her gift for delivering great performances, not evident from either “War Horse” or “Curious Incident.” Then again, she’s working with far stronger, if often meandering, material with Kushner’s “Angels.” On one side of the stage is Andrew Garfield’s victim, the female impersonator Prior Walter, who is dying of AIDS; and on the other is Nathan Lane’s villain, the notorious Roy Cohn, who is also dying of AIDS but calls it liver cancer, because enormously well-connected attorneys don’t succumb to diseases contacted by gay men, who, in Cohn’s opinion, are all losers. Oddly enough, the beating heart of this production is Lane’s Cohn, a Kushner character that personifies why winning is everything in politics (and sometimes other endeavors) and why well-intentioned liberals generally end up losing. “Perestroika,” which Kushner has continued to rewrite over the years, remains something of a fascinating mess, with most of the fascination coming from Elliott’s stagecraft and the complicated relationship between Lane’s Cohn and Pace’s tortured gay Republican Mormon husband-boyfriend-protégé-attorney. Although Kushner clearly abhors Cohn and Joseph’s politics, he gives them the strongest emotional bond in the play. Theirs is an adoptive father-son connection fraught with naked ambition, sublimated lust and misplaced loyalty, but held together by love and respect. Kushner’s morally correct characters are far less interesting, in part, because Prior and Harper are so utterly noble and reactive. (It might help if Kushner had given them jobs.) Pain has turned them into seers, but the sheer weight of their bitching about their respective partners grows monotonous. There are only so many variations on total victimhood that an actor can deliver and both Garfield and Gough begin repeating themselves early in “Perestroika.” Where Arthur Miller occasionally takes a ruler to slap the wrist of a misbehaving character, Kushner uses a Mack Truck. In the end, Joseph and Louis receive so much verbal grief from Prior and Harper that crucifixion would be considered a light sentence. McArdle, playing the bad boyfriend, manages to win our sympathy by being tortured to the point of distraction, and makes Louis’ verbal spats with himself comic showcases. It’s when Louis turns on Joseph, chastising him for his Cohn connection, that Kushner’s Mack Truck approach creates an impossible situation for the actor. Gay men who sleep with Republican-Mormon attorneys ought to know what they’re getting into. Belize and Prior, when they’re not complaining about Louis, share beauty tips and trade campy quips from old movies. Given a dinner date with them or the truly formidable Roy Cohn and his protégé-attorney, who wouldn’t choose the two gay bastards?